Preheat oven to 350F. Bring 3 cups water to a boil in a medium sized pot. Add in the peeled and chopped sweet potato. Cook over medium heat, for about 5 minutes, until fork tender. Drain and set aside. Warm coconut milk in pan. Add sweet potato and banana. With a potato masher, mash in the cooked sweet potato and the banana into the pot. Now stir in the cinnamon, maple syrup, and vanilla. Adjust seasonings if necessary. Cook on low for another few minutes. Make the topping by covering chopped walnuts in melted coconut oil. Add enough cinnamon and cacao powder to coat the walnuts and make a clumpy mixture. Pour the sweet potato mixture in a baking dish and spread out evenly. Now sprinkle on the walnut topping. Bake uncovered for 20 minutes, at 350F. After 20 minutes, set oven to BROIL and broil on low for a couple minutes, watching very closely so you do not burn the topping. Remove from oven and serve. makes 3-4 servings. 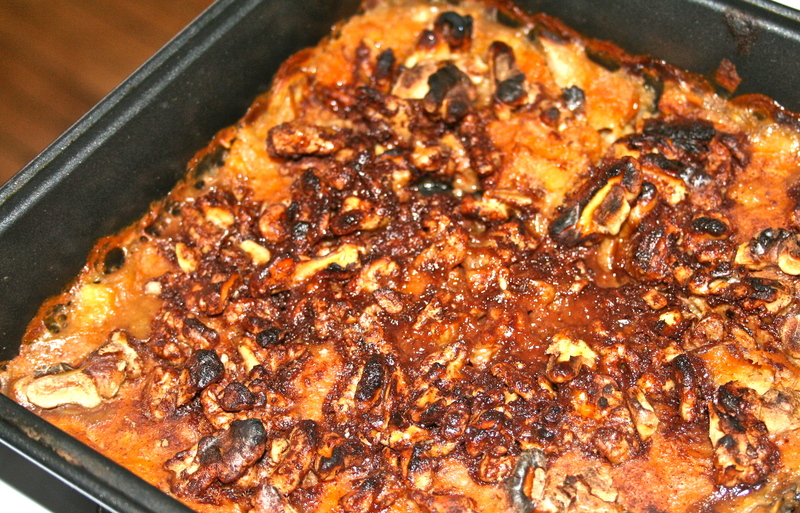 *Adapted and paleo-fied from Oh She Glows Sweet Potato Oatmeal Breakfast Casserole.